Here is how we displayed the stars at our party. 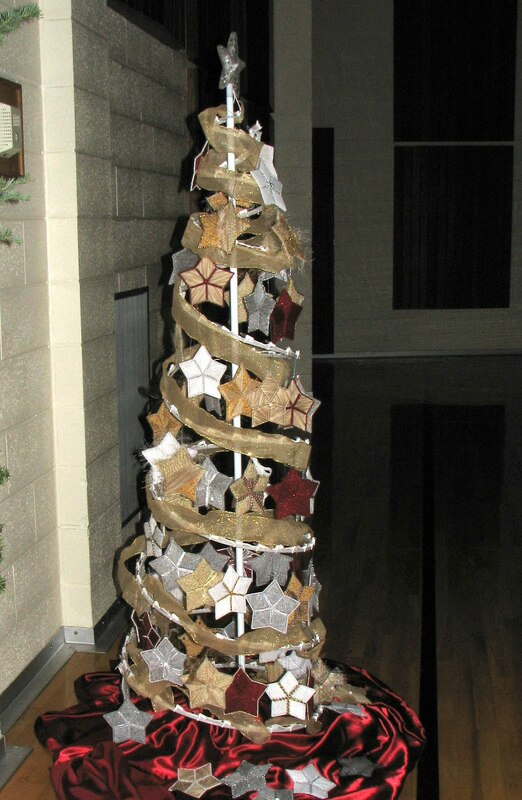 Everyone got to choose their own star at the end of the program. 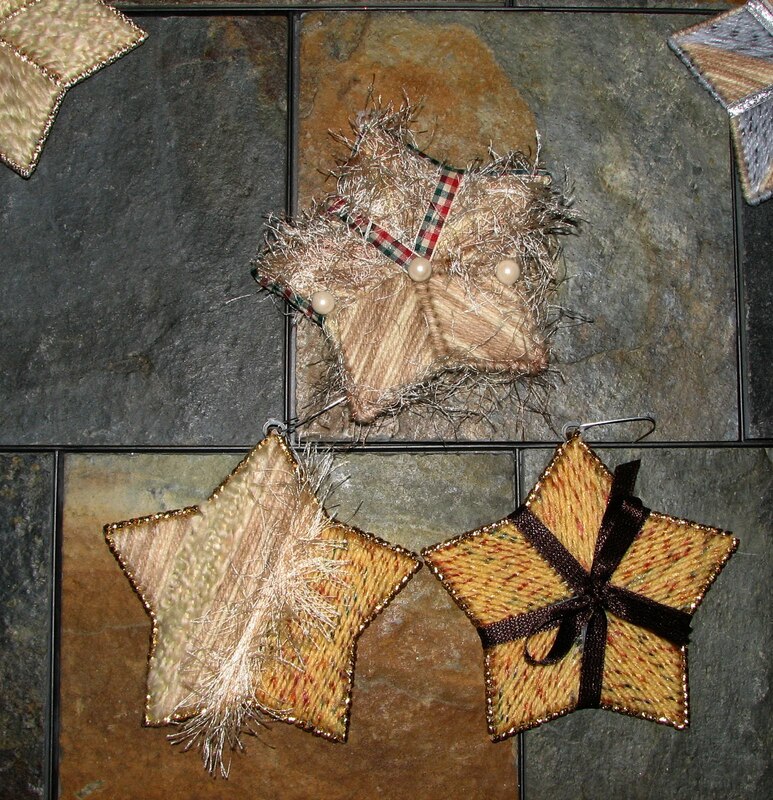 Here are more of the stars we created for the Christmas party. 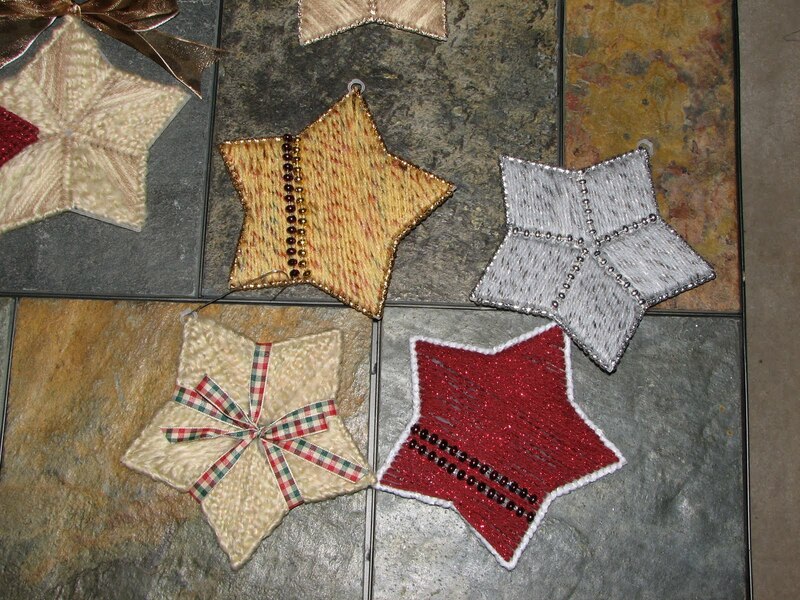 Four of us worked on the stars. I added ribbons, bows and beads for the final touches. 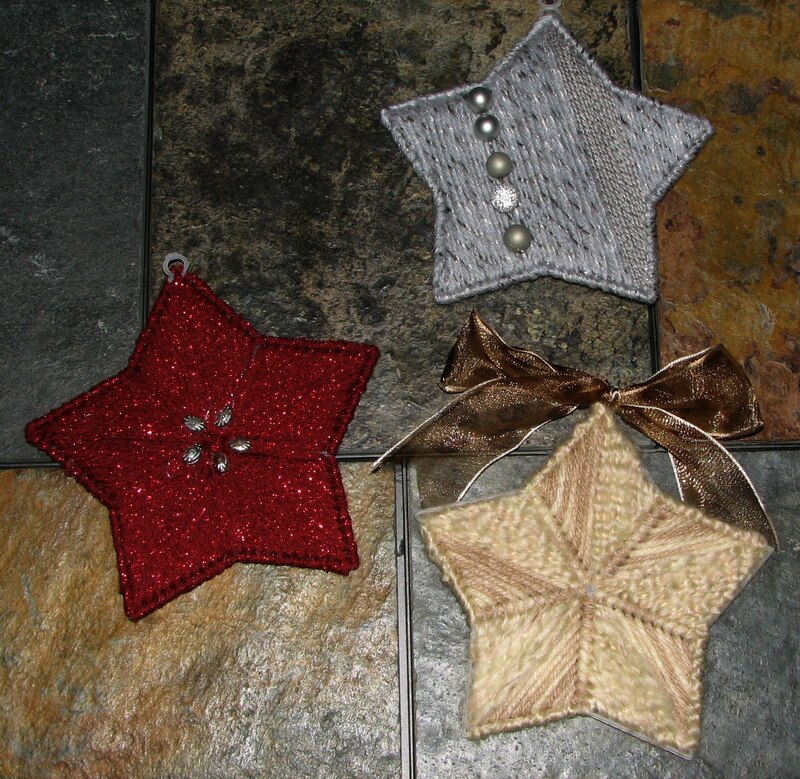 Mark suggested I do some with gold and silver yarn. 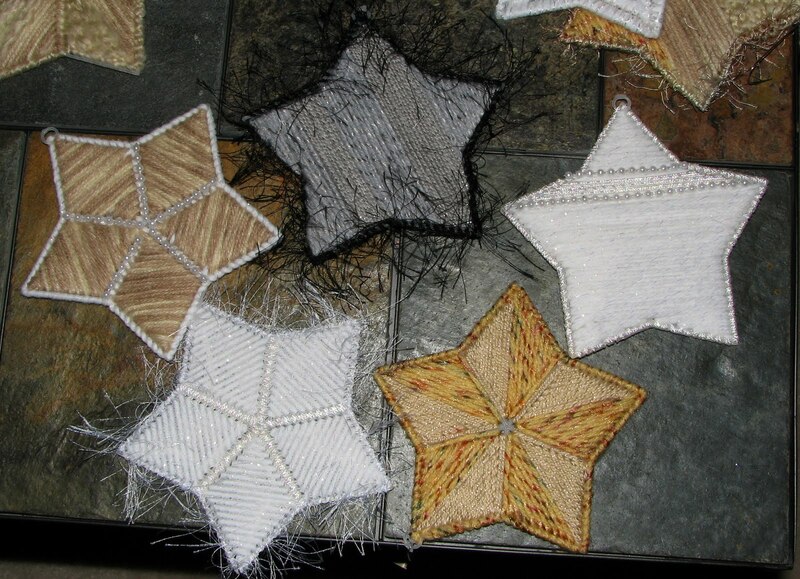 I used the specialty yarn that as fibers sticking out all over on some of the stars, mostly around the edges. It required a lot of patience. On this one I doubled the yarn. It took a long time, but it turned out fun. 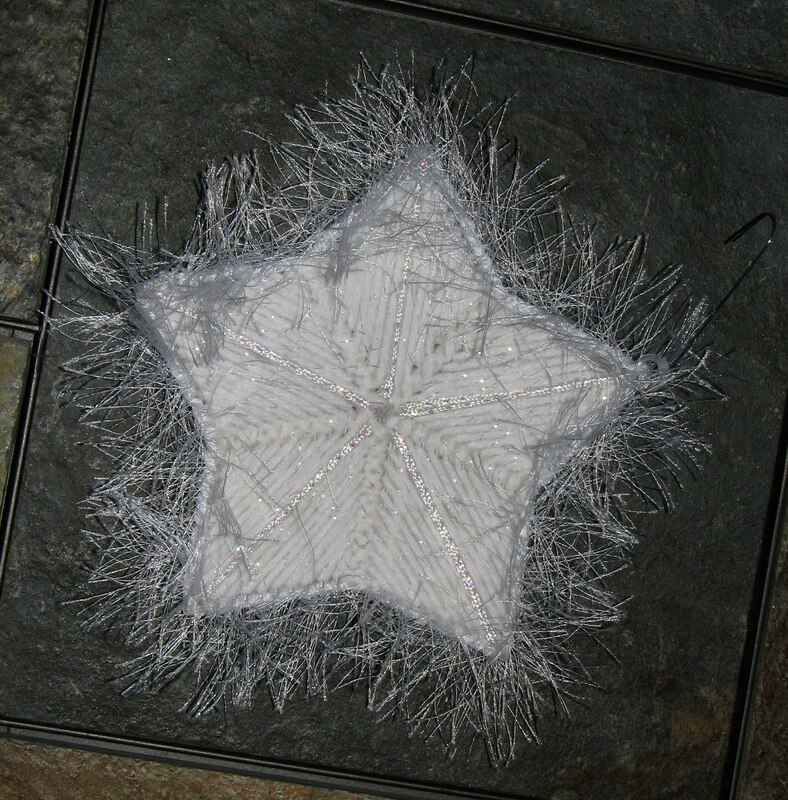 I tried using the specialty yarn on the inside of a star. I did three parts and that was all I could handle. It was actually a kind of scarry looking star. I filled in the rest with regular yarn and added ribbon and beads. I even glued ribbon around the edges. It’s the star at the top. It kind of reminds me of a favorite pet. I tried to find yarn with interesting textures. 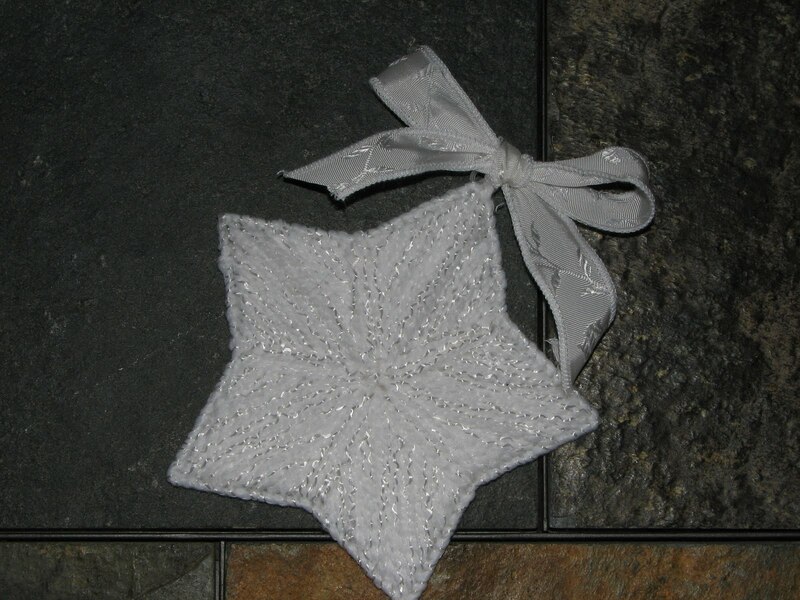 I think this white yarn looks so pretty. It’s simple, but elegant. For the bow I used ribbon left over from my daughter Catherine’s bridal flowers. It went really well with the yarn. 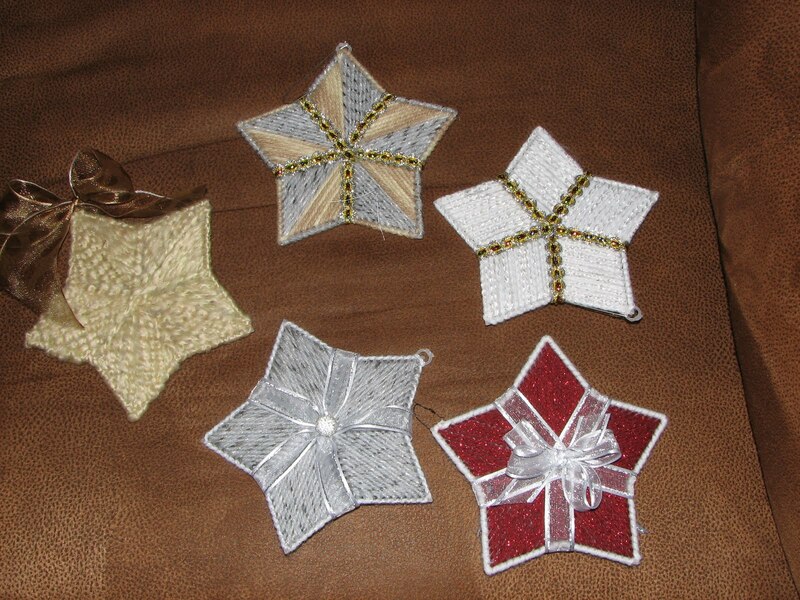 Here are some more variations. 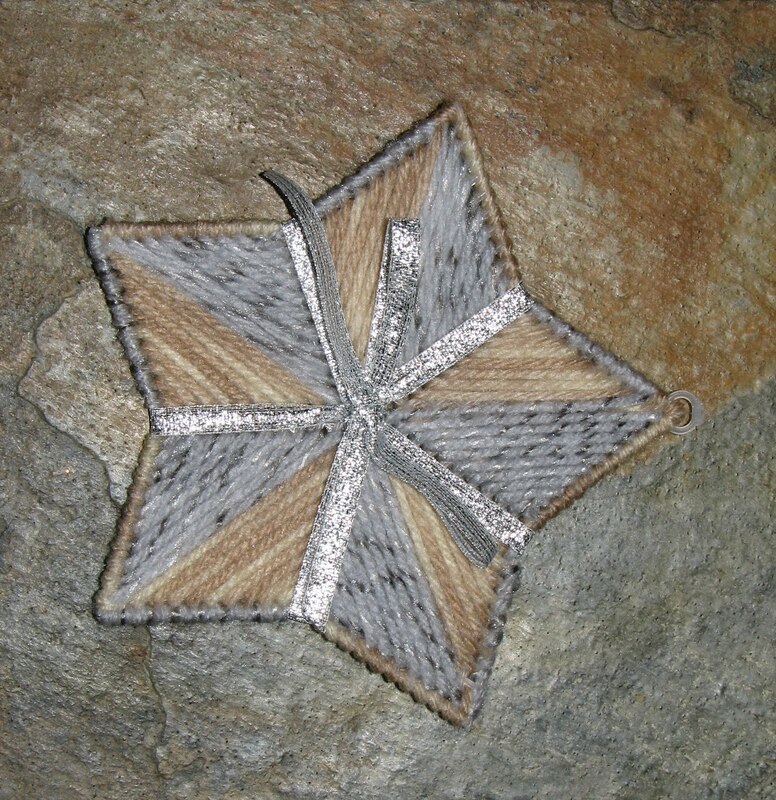 I have to admit the black fringe on the top gray star wasn’t too effective. 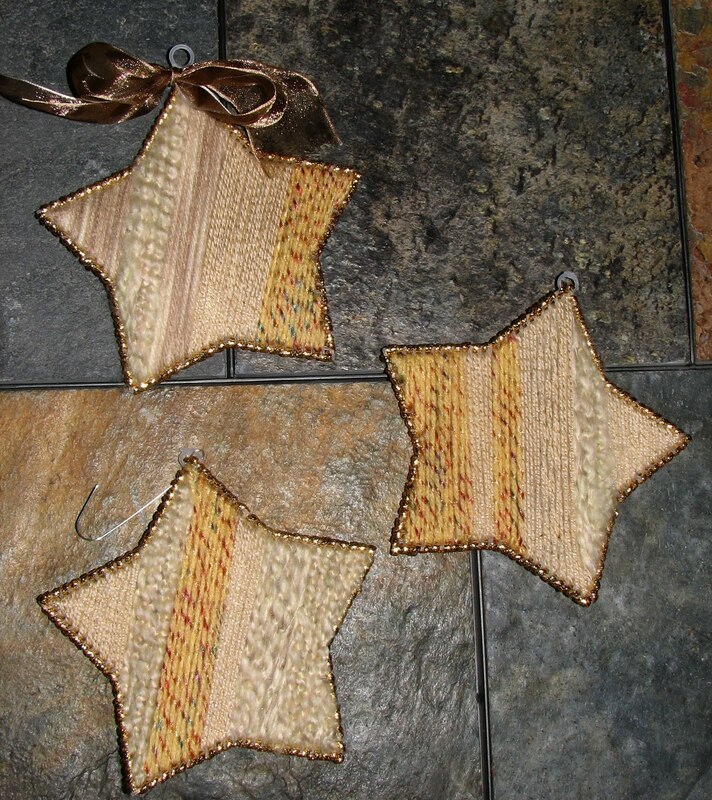 I liked these stars. 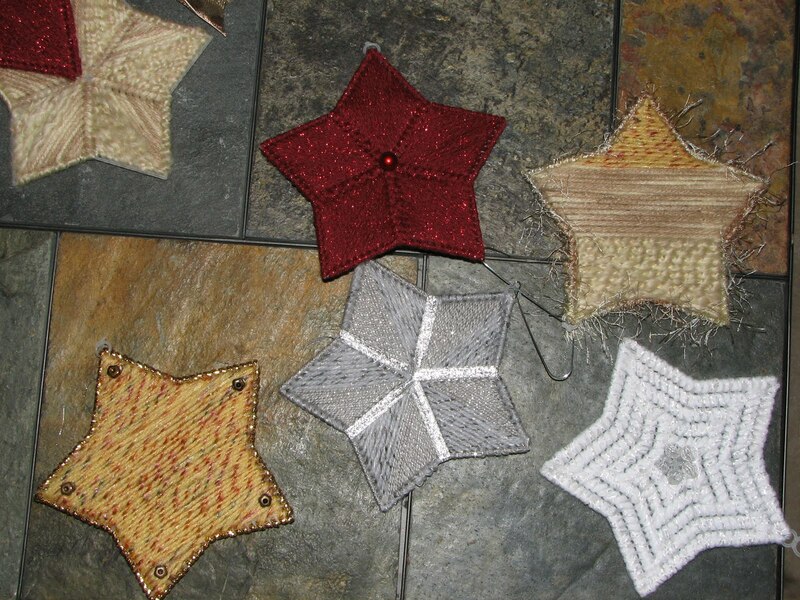 I filled them in at an angle and used several different yarns. Gold, silver, white and shiny red. 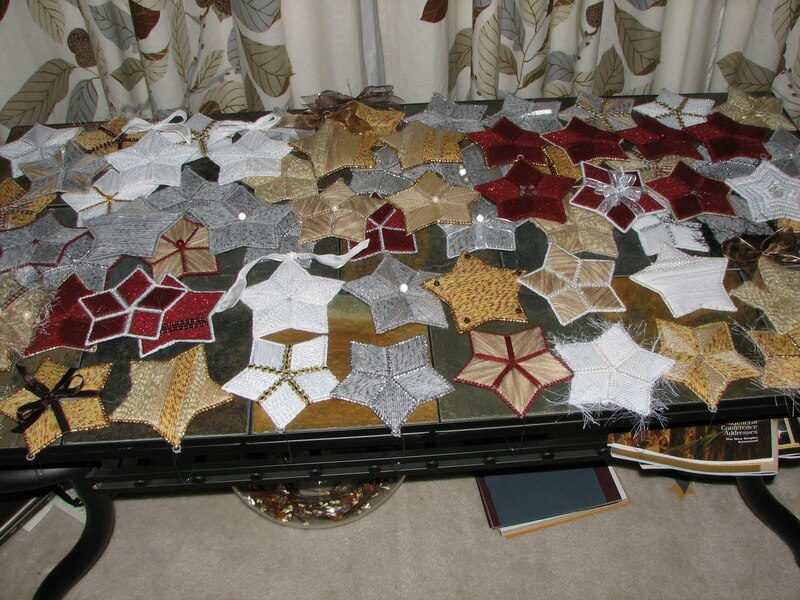 My coffee table full of stars.